One of my loves, who is actually the reason why I started blogging again after taking a couple years hiatus, started a meet up for black women entrepreneurs. I was very picky about how I spent my time because, well, I didn't have much to spare. However, since taking my jump, I'm more open to opportunities to network and get out of the house. I'm oucheah! Cuz ain't nobody gonna know about my product if I don't get out in deez streetz and tell them. Human beings are designed to operate in a team. We are not meant to do things alone. 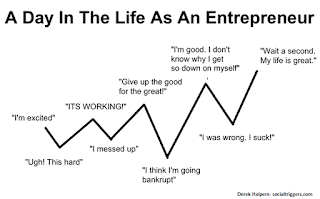 It leads to the dreaded emotional roller coaster that comes with entrepreneurship. There are days when you feel like you can take over the world and get it all done. There are other days where it is all too much and you just wanna take a nap. Then there are the days that you feel like you aren't doing enough, that you are a complete loser, and you start to rethink your life choices. All because you're by yourself. I mean, look at some stories of people being stranded after some kind of accident. A group of people is more likely to survive than a single person in the exact same circumstances. Let that sink in. So, even though I know all of that, I had a bad day this week. I did it too myself. It was not warranted. I started comparing my progress to someone else's. I wondered if I could make it happen. I wondered when my growth would reach it's tipping point. I wondered what I was doing wrong. Then I snapped out of it and gave myself some kudos, like my therapist taught me. After that, I had a conversation with a sister friend about being emotional. She reminded me of who I am and also reminded me of the source of those emotions *whispers* cuz she knows my real life. Then said "You'll be alright. Just keep swimming." She was right. I snapped out of it. But then I had to talk about that roller coaster moment with someone who was at the meet up with me. My cousin, who is also my attorney. I hit her up and said "cousin confessions". LOL! I told her about my emotional roller coaster and what triggered it. We laughed at me for being "crazy" then we started talking about strategy and timelines. We had a few "ah ha" moments and felt good about Fancy Free when we ended the conversation. least talk about it. 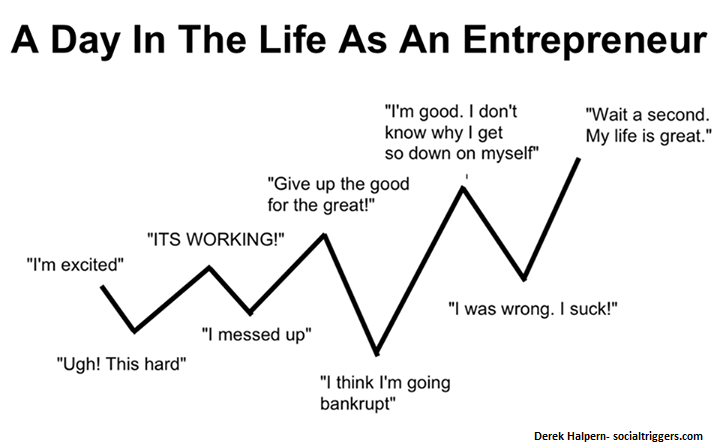 Entrepreneurship is not easy. It takes a lot of mental tenacity to make it through each day with the growth, set backs, highs, and lows. Any success story has a team of people pushing the main character through. Your team does not have to be in the same industry, it's just important to have a safe place where you can be vulnerable and receive encouragement. In the end, I know that I made the right decision. My father and husband always remind me that the tough choice is usually the best choice and that nothing worth having will be easy to come by. Fancy Free, LLC. is the manufacturer of quality products for hair and skin. Our motto is "Keeping you chemical free." Visit our website, www.fancyfreellc.com, to see a full range of our products and services. Sine up for our mailing list to receive natural hair tips and stay up to date on sales and the latest happenings with Fancy Free.